–THE best insurance is taking measures to keep ourselves safe and healthy. To comply with that belief I recently made several adjustments to my studio process. One of the reasons for my increased vigilance was learning about a well-known artist who developed a serious toxicity issue from getting oil paints on his skin. Over time the absorption of paint on his hands built to a toxic level. I have since opted to use gloves while painting. I was fortunate to find two types I really like. My favorite is this brand variation which has a textured surface that allows sweat to evaporate. This is especially critical when working outside. The gloves are robust and can withstand multiple uses, so are a great value. I don't necessarily like the blue color so when I'm making a video or where I might be photographed I prefer these black gloves. It took time to get used to working with gloves, but once I did I prefer them while painting. It provides health benefits of course, but it's also great not worrying about the mess and subsequent clean-up. I built a log cabin in 1976 when I was 18, and in 1997 I accidentally burned it down. Thankfully no one was hurt, and financial loss was minimal. Yet the experience was traumatic. I can't imagine what others face when the outcome is more serious. Because of my experience, I keep a fire extinguisher and a fire-resistant trash can near my easel. Oil soaked rags are one of the primary causes of studio fires (read about cases of spontaneous combustion in studios here, here and here). The minor expense of a fire-proof trash can and an extinguisher will prevent greater cost and heartache later on. I highly advise these two additions to your studio. Keeping a solvent free studio by using palette knives (read more about my switch to palette knives here) or using a low-evaporating solvent like Gamsol are other ways to keep your painting environment safe. Additionally be sure to keep your Gamsol in an air-tight container. Most artist containers for solvents will leak over time as the seal wears out so be sure to check the seal occasionally. If you have additional ways to increase health and safety in the studio I hope you will leave a comment. 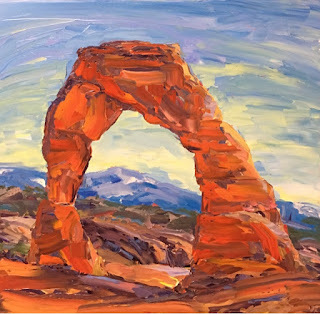 Above: State of the Arch, 24' x 24', available at Anthony's Fine Art. Good advice and every one should pay attention to working with organic solvents, since most are highly flammable, as well as being toxic. I had an experience with linseed oil while I was rubbing it onto a panel with a cloth. After I was done, I left the room and came back a few minutes later, and the cloth had spontaneously combusted. Being linseed oil I did not expect that to happen, but I looked up the MSDS on it and it is hazardous when in contact with cloth of various kinds. I think walnut and other oils artists frequently use are also flammable. I hope there were no negative effects from your experience. Thanks for sharing your experience.